The Jordan Eikona full-range drive unit is capable of being used in many ways as well as providing the basis for a range of excellent loudspeakers. Some of these were covered last year in our series, Audio Building Blocks. The culmination of the series was a project for a 4-Eikona Linear Array in a 32-litre reflex enclosure. The advantages of an Eikona Linear Array as opposed to a single Eikona include greater sensitivity, higher power handling and holographic stereo imagery. The Reflex Array gives these benefits down to bass frequencies but if you prefer a smaller enclosure with less reach into the depths, a sealed array is the way to go. Each Eikona requires a minimum of 4.5 litres for a sealed enclosure. This gives a rolloff which starts at 80 Hz but is more gentle than that of a reflex design- in fact by 35Hz both produce the same level of output. Correctly positioned, an Eikona Linear Array ideally stretches from below to above ear level. So the uppermost Eikona should be around 1 metre from the floor – it depends on seating position but this gives good coverage. As four Eikonas will require only 18 litres, this opens up the possibility of a tall, elegant column enclosure. We can go one step further by making the cross-section an equilateral triangle. It looks unusual but the lack of parallel surfaces enhances the sound and, when it is placed against the listening room wall, the Eikonas are angled inwards correctly. A floor-standing equilateral triangle column with internal surfaces 16.5 cm wide gives an internal height of 153 cm, which gives room to adjust the height of the array. 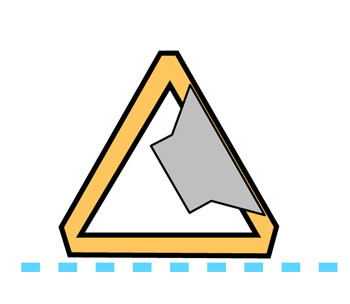 The ‘corners’ of the triangle can be rounded or planed flat depending on the desired final look and the end result takes up less floor area than a small, stand-mounted bookshelf speaker. Not bad for a speaker with unparalleled imaging, 92 dB sensitivity and 400 watts power handling. The plans for the Eikona Triangular Array can be downloaded here.